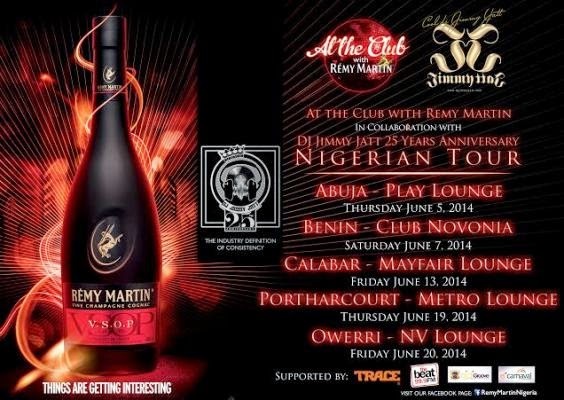 Premium Cognac brand Remy Martin in collaboration with DJ Jimmy Jatt proceeded on a 6 Nigerian cities tour to celebrate his 25th Anniversary last week with Abuja followed by Benin City and it was all forms of partying fun. 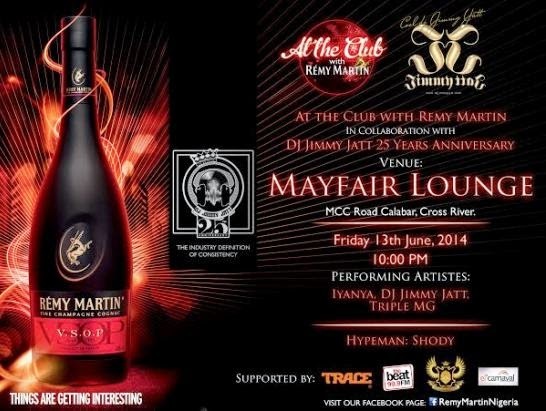 This Friday13th June, the‘At the Club with Remy Martin x Jimmy Jatt Tour’continues in Calabar. 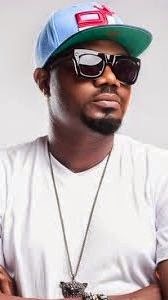 The Mayfair Lounge will play host to Cool DJ Jimmy Jatt alongside Iyanyaand the Triple MG family.Free Remy Martin Goody bags will be given to fans around the states during radio interviews and at the venues. Exciting performances of A-List artistes continues to be the norm in every state as the tour rounds off in Port Harcourt - Thursday June 19and Owerri- Friday - June 20with a final showdown in Lagos. Nice one. Let the party begin. Things of dis life is complicated, some people choose to be happy and for some makes them sad, no one choose to b sad. Life it's self leaves us with a decision. I choose to be happy no matter what I face. Okay sir/ma'am @anon5.44pm, ur English is terrible! Phew! U shd actually be in school focusing on ur grammar, rather than on dis blog speaking many many Gbagauns! Linda am in Lag o, won't u invite me ova 4 lunch? *will deff be der* no sleeping for me ds night. Oya naa. Make we go d gbedu.